For more information on current projects, plans, or volunteer opportunities, please contact us via email. We welcome and appreciate any and all donations. Every donation of time, goods and services, or money directly supports our local projects and helps make the Rail Trail happen. We have a large number of specific tasks and projects outlined so that we can improve our communities today and build a foundation for the future. Donate online here using a Credit Card or Paypal or DAF Direct. We accept donations through Facebook on our Facebook page. We accept donations through NetworkForGood. If you sell items on eBay you may donate a portion of the proceeds to Friends of the Concord-Lake Sunapee Rail Trail using eBay for Charity. This saves you money on the selling fees eBay charges. Its their way of helping you help us. When shopping online at Amazon use Smile.Amazon.com instead. You select the charity you would like to support and every time you shop at smile.amazon.com Amazon will donate 1% of the sale to your charity. This costs you nothing and over time builds into a nice donation for your favorite charity, Friends of the Concord-Lake Sunapee Rail Trail! Matching gifts. We are now part of several matching gift programs. If your employer supports matching gifts please inquire if giving to Friends of the Concord-Lake Sunapee Rail Trail is a possibility. We are currently enrolled with Benevity’s Spark program, Blackbaud’s Employee Giving, and we are taking the steps necessary to get enrolled with the United Way. You could start a GoFundMe campaign to help support a specific project. For more information on our organization please visit Guidestar.org by clicking on their logo. Guidestar is where people go to check up on the activities and legitimacy of non-profits. 5 of the CLSRT board members: Fred Nystrom, Kristen Riley, Tim Blagden, Derek Lick, Jason Mutschler. Working hard outside the frame: Charles Cautley, David White. A partial list of local groups with a particular interest in the Rail Trail: CLSRT is working to further the trail in all communities. Several communities have local efforts also working on the trail. 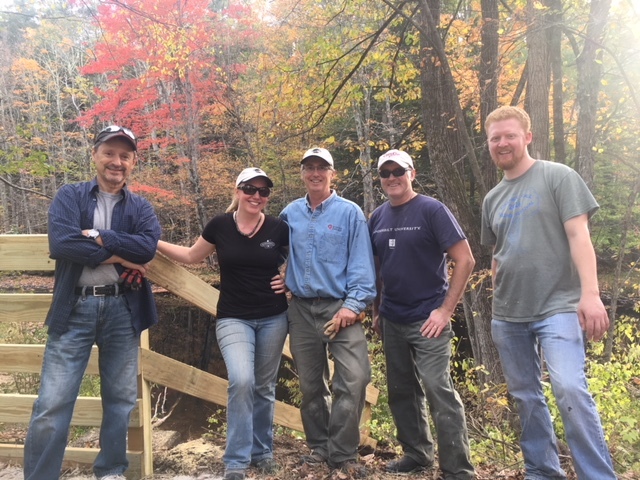 In Bradford the Rural Heritage Connection of Bradford is working with the Lake Sunapee Snowmobile Club and the Friends of the Concord-Lake Sunapee Rail Trail to make extensions to the Tilly Wheeler Trail.